4 bedroom, 3 bathroom villa in the The Abbey at West Haven community. Owned by John Hargreaves. Ref: 1042. ·	3 Remote LCD Colour Cable TV’s, one 32" the others 19".
. FREE access to the community clubhouse offering table tennis, gym equipment, tennis, volleyball and a large community pool. The living space of the villa is fully air-conditioned. Our lovely 4 Bedroom Executive home at The Abbey, West Haven, sleeps 8 plus an infant in a cot. It is only a short and easy 12 minute drive to Disney. Our spacious home provides every comfort and luxury inside, that you could wish for and an inviting private heated pool together with a spa outside. Everything is included in this exceptional villa which provides 2 Master En-Suite bedrooms, 2 twin rooms and a further family bathroom, offering you the opportunity for the holiday of a lifetime. John and Ann welcome you to share our deluxe 4 Bedroom, exquisitely furnished and tastefully decorated, Executive Home with its own private pool and spa, throughout your vacation. Situated on a small, intimate, gated community, The Abbey occupies one of the highest points in Central Florida – so high, that on cloudless nights, you might just see the fireworks from the EPCOT resort!! This not the only reason why The Abbey is such a special place. Lushly landscaped boulevards, lakes and wetlands help maintain a harmonious balance with nature. Its convenient location, provides easy access to Disney and the many other Parks and Attractions, not forgetting the wonderful beaches that Florida offers. Your place for fun in the Florida sun! Our luxury executive single-storey home sits on a good sized lot and has almost 1800 sq ft of air-conditioned living area, a two-car garage and an upgraded 14ft x 28ft screened Elite pool plus spa set in an over-sized deck of 40ft x 23ft together with a Games Room with a number of games tables. 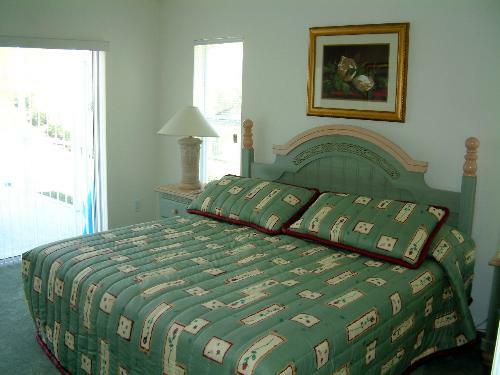 In addition, for your convenience, ceiling fans are provided in all the bedrooms, living room and covered lanai. A garden to the rear of the pool provides more leisure and relaxation space. Overlooking the pool with sliding door access to it is the large deluxe Master Bedroom 1. Its en-suite bathroom has his and her vanity basins complete with full size vanity mirrors and theatre lights. There is a roman tub and a huge walk-in shower to complete the feeling of space. The bedroom has a large king-size bed and has a 19in remote colour LCD cable TV and clock radio making this a wonderful room in which to end the day. The bedroom also features a large walk-in closet which houses a complimentary safe for valuables. Located off the living area, this bedroom has the great benefit of its own en-suite bathroom comprising single vanity unit, WC and a combination shower-bath unit. 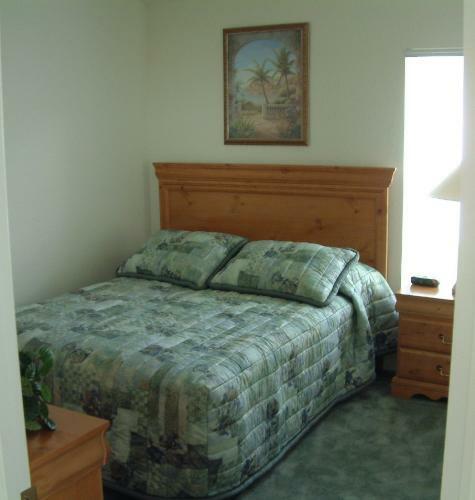 The bedroom itself, again tastefully decorated, is of a good size and has a queen sized bed and walk-in closet. For your convenience there is a remote 19in colour LCD cable TV. 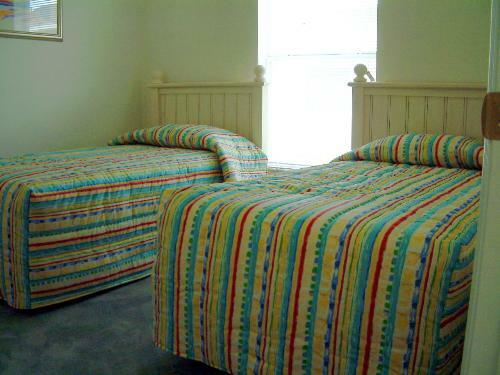 Again these rooms offer good-sized accommodation and are tastefully decorated. Both rooms have large walk-in closets. To complete that magical feeling for our younger guests one of the rooms has a Disney theme. Situated between the twin bedrooms and therefore offering easy access, this bathroom has a single vanity unit, WC and a combination shower-bath unit. 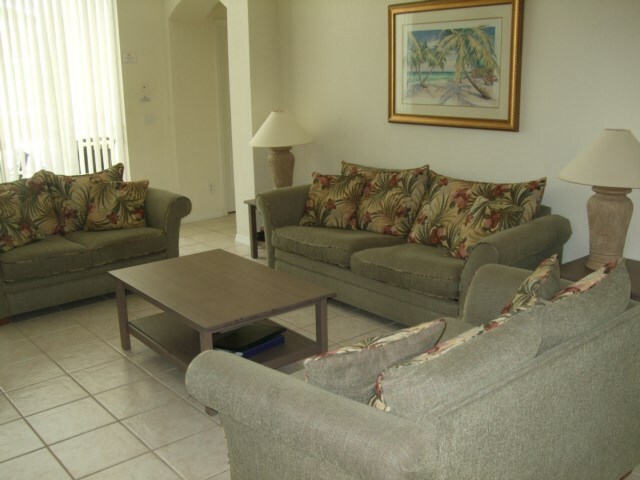 The large, 28ft x 14ft living room is furnished in a Floridian style, with three sofas, one of which is a sleeper sofa. The raised ceiling and large windows provide a light, airy and cool place to relax and the children to play, after hitting the theme parks. Whilst relaxing in the living room, the 8ft sliding doors offer views to the lanai and the inviting pool. For your entertainment, a remote 32in colour LCD cable TV, video/DVD and hi-fi system are provided. 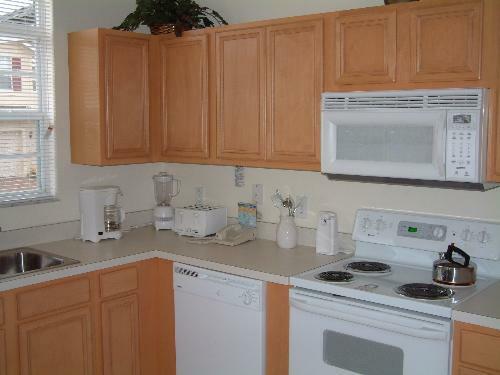 Our villa provides a kitchen equipped to meet all your culinary needs. It boasts a deluxe appliance package complete with large refrigerator with ice-maker, built-in electric oven and hob, dishwasher, waste disposal unit and built-in microwave. Within the kitchen is a light and airy breakfast nook complete with table and four chairs for those informal meals. Dining-in could not be made any easier or more pleasurable! This has been converted to a games room comprising, pool table, table tennis, air hockey, hoops and electronic darts and provides fun for all the family! 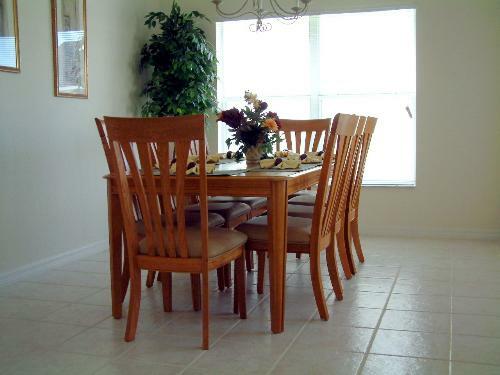 For those more formal occasions or larger gatherings this room comes complete with table and 8 chairs. The room provides an ideal place for a family meal over which the excitement of the day can be re-lived. 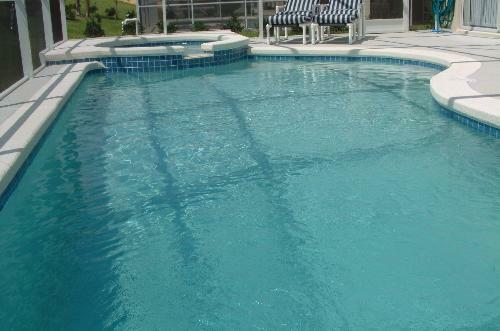 Our large, screened Elite pool and extended 40ft x 23ft surrounding deck provide the perfect oasis to soak up the renowned Florida sun and then to cool off in the crystal clear water of the pool. 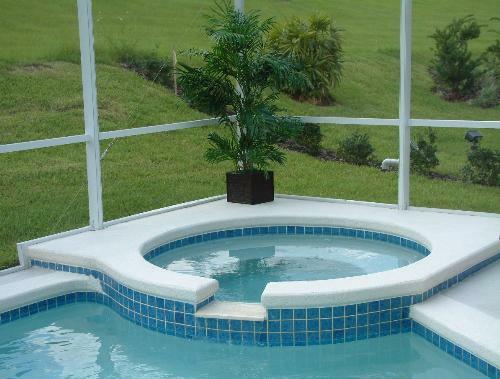 Should you require, the pool can be electrically heated. Why not take an invigorating dip in our heated spa. What better way to soothe and relax yourself after a tiring day visiting the attractions that make Orlando one of the world’s leading holiday destinations! For golfers the impressive Greg Norman designed courses at the Champions Gate development are moments away. The community is set amongst orange groves and wetlands providing opportunities to view wildlife in their natural habitat. For the comfort of our guests we operate a no smoking and no pets policy. Average rating: 4.7 / 5 from 9 reviews. We had an amazing time this year in Orlando, John and Anne's villa is superb and has everything you'd ever need. It's well finished inside and has everything you'd need to make this a relaxing place or a base for your Orlando adventures. Location wise it's perfect, as it's close to both Disney and Universal parks as well as Orlando International Airport and you can use either US27 or the I-4 as again both main roads are located right next to you, so you have a choice if you find that traffic is busy in the I-4. The pool and spa are perfect, I'd recommend getting the heating turned on for a little extra so you can enjoy the full effects of the spa. There's also a games room with foosball and table tenis as well as a pool table, and an excellent 55" LG TV that will allow you to watch cable or cast your Netflix for a bit of evening entertainment. Again there's so much close to where the villa is, you probably won't have time to watch any TV. At Champions Gate there is a local Millers Ale House whis is only about $7 away in an Uber if you'd like to go for some drinks and a bite to eat, as well as Chilli's and Panera Bread. Also close by on the US27 is IHOP where you can get an excellent breakfast if you don't want to cook yourself. This was my second time at Florida Dream and I'm already planning the 3rd. John goes above and beyond excellent as a host, very organised and knowledgeable and great to deal with, alwas answers any questions really quickly, can't recommend both John and the Florida Dream Villa enough. Thanks again for sharing Florida Dream with us John and Ann! All the best from our family to yours! Owner's response: We are delighted that you had a wonderful time in our home and look forward to welcoming you back. Have had a lovely stay in the villa. Very spacious, clean and well equipped. Good communication and welcome from the management company. Just a quick note to say that we left your lovely villa bright and early this morning after having a very relaxing, busy and enjoyable week. This is our 23rd visit to Florida over the last 18 years and have stayed in 20 different villas (some good and some not so good) and I can honestly say that I have felt the most comfortable in your villa. The internal house temperature was perfect, the beds comfortable and we have both slept like a baby all week. With only being in the Orlando area for one week, we tend to try and cram in 2 weeks of enjoyment. The consequence of this is that we get very little time to enjoy the pool or games room. Maybe next time we should spend a little more time around the pool. Just one thing to tell you (and I have left a note for the management company), in an attempt the help with the housekeeping, we put some towels in to wash on Thursday night. When it came to drying them, we attempted to use the tumble drier, but we couldn’t get the drier to work. Could have been operator error, but I thought I better mention it. Your villa is a credit to you and I thank you for allowing us to stay in it. The Villa really did surpass expectations, clean, well equipt, spacious, great location, the owners really have thought of everything! Games room was a nice treat for those Florida rainy afternoons and he pool and jacuzzi were a god send in the heat! Disney parks just 10 minutes drive, supermarket 5 minutes drive and loads of places to eat nearby. Would absolutely recommend to anyone thinking of a trip to Florida! The owners are also very responsive to any questions you may have. Owner's response: Thank you for your lovely comments. We look forward to welcoming you back. Booking the villa with john was a simple process & nothing seemed to be too much trouble with my questions via Email. Something I was grateful for as I've never hired a property on our previous trips & john put my mind at rest. About the villa - it is wonderful, plenty of room in all bedrooms & the living area , pool & spa is fantastic ( quick warm up time & lovely to sit in after a hard day at the Parks!) The games room has enough to keeps younger kids happy on wet days , pool table , darts , hockey table ETC. My one suggestion would be a tv in every bedroom ( as suggested by my son) If they had this villa would get a five star rating from me - that's the only suggestion on an otherwise perfect stay. Thank you for the use of your wonderful villa. We have been to Florida many times but this year wanted a more relaxing holiday (no theme parks). The villa was a perfect base from which to explore other areas of Florida. The pool, spa and lanai area were great and many happy hours were spent there. 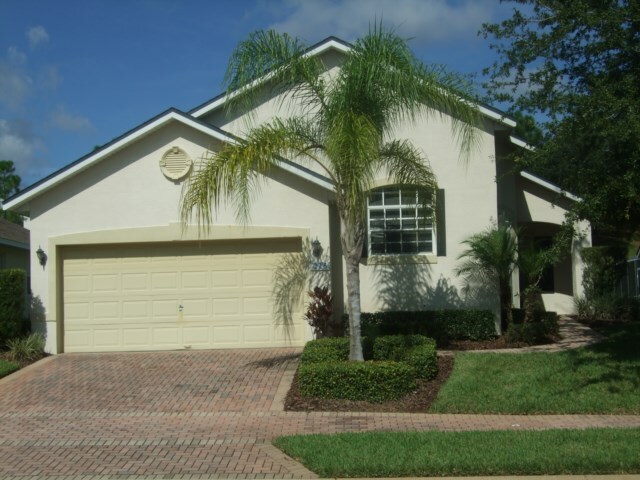 Beautiful and well maintained property in a lovely location within easy reach of Disney. Facilities provided were first class and would recommend this rental to anyone looking for such a property within this area. This is the most beautiful villa in a lovely quiet and relaxing location, we love it. The owners clearly put a lot of work into keeping it in first class condition, the new sofas are lovely. Would highly recommend. Your enquiry will be sent to villa ref 1042 only. This page has been viewed 14120 times since 24 Oct 2003.